There are 12.5 million hunters over the age of sixteen each year who spend around $23 billion annually on expenses necessary for the sport. The purpose of this document is to provide you with extended knowledge of the outdoor sporting industry as it relates to promotional products, as well as offer tips to help expand your cap sales into the market. In this series, we will look at different types of companies within the hunting and fishing markets, so that you will have a better understanding of how to target each. You will learn how to reach out to common decision makers in various businesses both small and large. You will also learn how to optimize sales among differing promotional product usage behaviors. Today, we’ll cover hunting companies. Next time, we’ll look at businesses that cater to fishermen and other outdoor enthusiasts. Hunting lodges are a sort of getaway retreat or vacation spot for outdoor enthusiasts. These are cabins or other housing units that hunters can rent all season long. 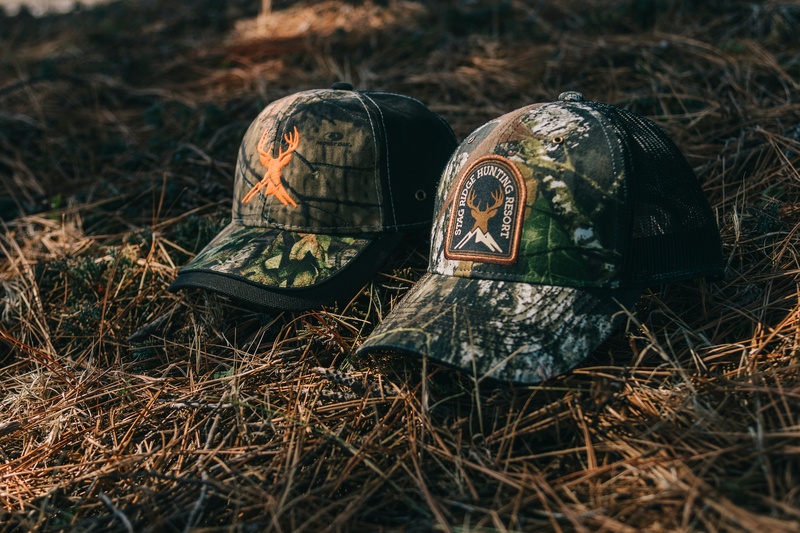 Hunting hats with the lodge’s logo can be given to guests when they check in as a welcome gift, or when they check out as a thank you gift. They can also be worn by the lodge employees—front desk, housekeeping, groundskeepers, hunting guides, etc. as part of the staff uniform. Hunt clubs are groups of people who get together to form a club with the goal of working together to have a place they can hunt each season. They will pay a club membership fee to the landowner in order to hunt on his land. Reach out to both hunt clubs and landowners in your territories to see how you can help them gain more members, or advertise the land they offer. Some hunters will clean and butcher their own kill. However, many will send the meat to a processor to be butchered and made into specialty meats like jerky, or summer sausage. Since this is a very specialized business, it is imperative that they are well known among the local outdoor sports community. It is your job to help them understand that in order to maintain and grow their customer base, they need to advertise to hunters in a way that will really reach them. Branded camouflage headwear does this perfectly. It is a piece they can wear on their next hunt, or at their club’s next meeting further expanding the brand’s reach. A good way for meat processors to go about this is by offering a special throughout hunting season in which they give away free hunting hats for kills over a certain weight. It is common for hunters to take their kill to a taxidermist who will mount it into a trophy to be hung on the wall. This too is a highly specialized business, so advertising is of the utmost importance for taxidermists to grow their business. Hunters will naturally advertise by word of mouth. However, if the taxidermist gives his customer a tangible gift like a hunting hats instead of just business cards, the likelihood that the hunter will tell his buddies about it is significantly increased. If you want more information on selling promotional caps into the outdoor sports industry, order a Business Development Kit today! Don’t forget to check back next time as we look at other outdoorsy businesses. What market would you like to see us cover next? Let us know in the comments below. You can also follow us on Facebook, LinkedIn, and Twitter.